Don't want to make the same old resolution... again? Here's a list of what we've learned in 2009, plus things that will hopefully make our 2010 healthier. Don't want to make the same old resolution again? A great way to look at resolutions is to think about the things you learned in the past year and make them a part of your life in the New Year. What news in 2009 will make you live differently in 2010? I asked my colleagues at Health what they thought were the biggest health stories of 2009—research they shared with their friends, news that made them change the way they care for themselves, topics they talk to their own physicians about, or stories that personally changed their lives. Here's a list of what we've learned in 2009, plus things that will hopefully make our 2010 healthier. Alcohol and breast cancer: After reading that wine may increase the risk of breast cancer, one staffer says she now limits herself to one glass of wine a night when she meets her girlfriends. She's also spread the word to her friends, sisters, and mother, who's in a wine club. Hydroxycut: One of our staff members has been talking to her doctor about the lasting effects of taking Hydroxycut after a recall and a strong warning from the FDA in May. Hydroxycut was linked to liver damage, and a young man died after taking it. "I always knew it was bad for my body, but I took it like a vitamin when I struggled with my weight in high school," our staffer wrote. Her wish: Better regulation of weight-management products. Flossing: No one really loves doing it, but flossing can add more than six years to your life by eliminating inflammation-causing bacteria. Recent research shows oral hygiene (or lack thereof) is linked both to cancer and heart disease. One of our editors who has been a lifelong flosser says she's telling everyone she knows that flossing can help save their lives. Annual pap smears: In November, a study showed that many doctors overprescribed pap smears. Shortly after, the American College of Obstetricians and Gynecologists released new guidelines suggesting that women have their first pap smear at age 21, and should be screened every two to three years depending on their age. Now three major organizations suggest women can cut back on the number of pap smears they receive, under certain conditions. One of our writers says she and her friends have had a lot of discussions about the news. Despite the suggestions, she's still planning to go every year. "I've have had [too] many friends with pre-cancerous cells that needed to be removed," she wrote. Yearly mammograms for those over 40: You probably remember the debate over this hot topic. A panel of experts announced their opinion that women should have their first mammograms at 50 and then schedule one biannually. This was a contrast to the former guidelines, which recommended that women over 40 should get a mammogram every year. The panel's opinion confirms one of our editors' long-held beliefs: She's still scheduling her mammograms every other year. Childhood obesity: In September the British Medical Journal said current strategies to fight childhood obesity aren't working: Kids are drinking less soda, but they're still not getting enough fruits and veggies. And physician-led intervention had no long-term effect on eating and exercise habits. One of our writers, who doesn't have children, says she's always got an eye out for yummy kid-friendly veggie recipes for her friends who do have children. Gotta love her "it takes a village" attitude! Eat breakfast: In 2008, a clinical professor and endocrinologist presented research about the benefits of eating a big breakfast to lose weight. I don't try every diet that comes to my office, but when I got a galley of The Big Breakfast Diet a few months ago by the same researcher, Daniela Jakubowicz, I decided to give it a try. The scheme: Eat about half your day's calories by 9 a.m. Cooking and eating that much food in the morning is a bit of a challenge, but on the flip side: Buh-bye, hunger! I was so full I never even thought about mid-day snacks. Vitamin D: There's still some debate about this wonder vitamin, but it has one editor talking: "I read that people over 50 are not as good at converting sunlight to vitamin D. There were all sorts of studies that reported that vitamin D may have helped fight various cancers (most recently lymphoma), increased muscle power, helped brain power, etc." This editor got tested and found out her vitamin D levels were low, so she started taking a supplement. She says her energy is up, her hair is healthier, and she may be preventing cancer. Not getting enough can raise your risk of death by 26 percent, and while researching a story some time ago, an expert told me overweight black women who work indoor desk jobs were at risk. Needless to say, I've boosted my vitamin D too. 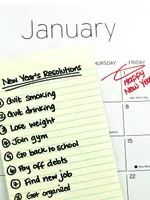 Your turn: What news in 2009 is going to change the way you take care of yourself in 2010?